The model range of GSR vans provides working heights of 12 to 17 m and is installed on various vehicles, for example, the Ford Transit or Nissan Cabster in 3.5 t. Range, or on a Mercedes or Iveco in the 5 t. category. These machines distinguish themselves through their robust and maintenance-free design. 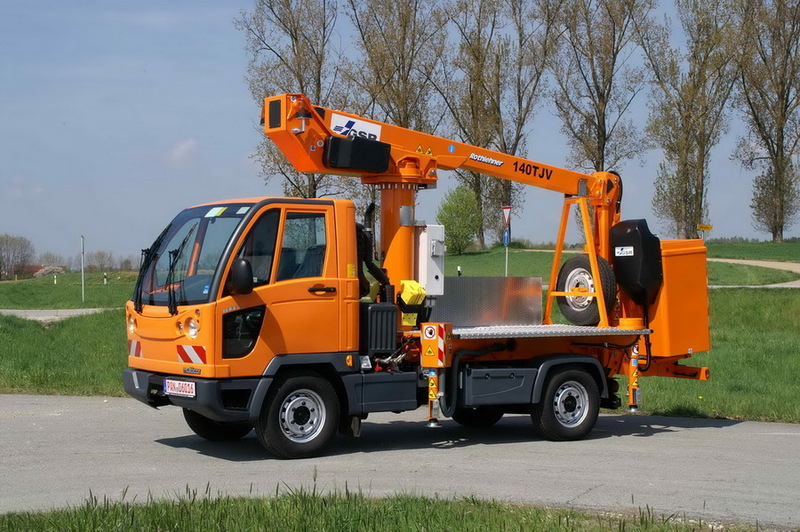 Technology features such as „1000 V insulation“ and „restricted driving without outriggers“ make these models particularly suitable for municipal applications. Besides an extensive range of standard features, a wide range of further accessories and optional equipment can be selected. The Van-mounts are also available as „Compact-Versions“ on MB Sprinter or VW Crafter chassis with 4 outriggers. Both models E140TJV and E170TJV can be mounted as 3,5 ton vehicles, especially with a huge extra capacity and with 4-wheel drive. Using a 4,6 or 5,0 t vehicle there can be large-scale equipment boxes. Serial-equipment is fiberglass basket and the outrigger-control from the basket, as well as a 130° basket jib. A large package of extra equipment enables individual solutions for various fields of application, such as: lifting function without outriggers, 1000V Insulation, power supply, and many more. Model E 140TJV E 140TJV 5to.